This cake is free of dairy and eggs with a gluten free alternative included. Fluffy, moist, and delicious, this is THE go-to cake for both vegans and non-vegans! I think we can all agree that there’s no lack of dessert recipes on this blog. While I’m not vegan, I have a sensitivity to certain dairy products, so many of the treats I make are dairy-free and vegan friendly. Cakes have always been one of my favorite desserts to make. When I first got married, a friend gave me a Southern Living cookbook and I quickly began making some of the recipes to impress my new hubby. I broke it in by making their classic yellow cake with chocolate frosting. It was the first time I had ever made a homemade “non-box” cake, and let’s just say it wasn’t what I was expecting! Instead of shying away from homemade cakes, I was determined to make them better. I began making birthday cakes for my family and friends and was constantly trying new recipes. After having kids, I quit my job to stay home with them and in order to earn a little extra cash, I started a small side business making custom birthday and weddings cakes. Over the years, I’ve made hundreds of cakes and now can whip ’em up in no time! I have plenty of cake & cupcake recipes here on the blog to choose from, (Vegan Chocolate Cake, Summer Berry Cake, Chai-Spiced Cake, Orange-Cranberry Bundt, Chocolate Earl Grey Cake with Lavendar Ganache, Salted Chocolate Mocha Cupcakes, Berry Filled Vanilla Cupcakes, & more 😉) most of which are free of gluten, dairy, and refined sugar. But I also wanted to add a go-to vanilla cake. One that wasn’t necessarily “healthy,” but delicious and perfect to enjoy on special occasions. This cake does use natural sugar as opposed to coconut sugar or maple syrup, which helps to give it that fluffy texture. Coconut sugar works well in these Chocolate Cupcakes and Pear Bundt Cake, where the distinct caramel flavor complements the other flavors in the cake, but would be too overpowering in this simple vanilla cake. Since syrups tend to be a little heavier, eggs are used to give rise to the cake and to hold the overly moist cake together. In order to keep this egg free and not too dense, I found that granulated sugar worked best. 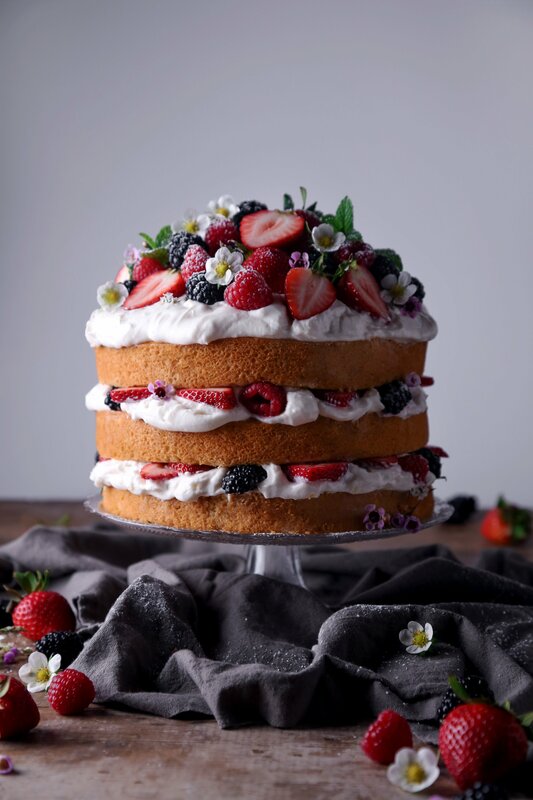 If you’re looking for a cake which is free of refined sugar, check out this Vegan Chocolate Cake or this Lemon Layer Cake with Fresh Berries! This cake is fluffy, moist, and pretty simple to make. Even though it doesn’t have eggs, this is hands down my favorite vanilla cake recipe, whether you’re vegan or not! I love the combo of strawberries with vanilla cake, so I added fresh strawberry slices in between each layer, along with the strawberry buttercream, but you can leave it plain too, if you’d like. Please let me know if you give this a try! Enjoy, friends! This cake is incredibly moist and delicious, whether you're vegan or not! Just sub regular milk and butter for a non-dairy version. Gluten-free vanilla cake recipe also included! Makes one 8-inch three layer cake or 2 dozen cupcakes. In a large bowl, mix together dry ingredients—flour, sugar, baking soda, baking powder, salt until well combined. To decorate, place on cake layer upside down on a decorative stand or plate. To keep the plate clean, you can tuck strips of parchment paper under the cake to catch the frosting. Decorate the top of the layer with strawberry slices and then top with a mound of buttercream. Use an offset spatula to spread the buttercream evenly across the cake. Repeat with remaining layers. Frost the top and sides of layered cake with remaining buttercream. Chill cake in the refrigerator for 20-30 minutes and go around the cake with a straight edge scraper to get a clean and smooth look. Top with optional glaze and decorate with fresh flowers or strawberries. Store leftovers in an airtight container in the fridge for 3-4 days. Beat butter and shortening until smooth. Add powdered sugar 1 cup at a time and beat until incorporated. Add strawberry powder and vanilla and continue to beat until light and fluffy, 3-5 minutes. Add more or less strawberry powder to taste. Beat cream cheese, sweetener, and butter together until smooth. If needed, thin with a little almond milk to get a pourable consistency. *Vegan butter is usually salted, so it adds a bit of salty flavor to this buttercream. For less salty flavor, use less butter and more shortening in its place. Oh wow, that one looks just gorgeous! I’m currently searching for a wedding cake. Sadly my husband-to-be is pretty much allergic to everything… So I would have to replace the almond flour, coconut and avocado. Any ideas for substitutes without using nuts and seeds? I’d really like it to work. If I were to substitute the AP flour with cake flour, almond milk with regular milk, and oil with butter (creaming the butter with the sugar first and mixing the rest of the wet ingredients there, then the dry), would the resulting cake still… work? Do you think it would be firm enough to support itself, and the frosting? Sorry if this sounds silly, I’m very new to baking. This looks truly wonderful, and I’m trying to find something egg-free for a friend’s birthday party. I’ll likely do a test run myself, but any insight would be appreciated. Hi Dio, it sounds promising! It is still a very moist and tender cake with regular ap flour, so my only concern would be that the cake flour might make it too ‘light’ to hold up well. It’s worth a try, maybe even halving the recipe in your test run to not waste ingredients. I do find that oil tends to make cakes more moist compared to butter, but butter would definitely add good flavor. I’m very interested to see how these changes turn out for you so please do report back with the results once you try it! I hope it turns out well! Did a test run with a third of the suggested recipe, seemed to work well enough – cake was indeed a bit on the delicate side and I suspect it might break easily if I was working with layers. Perhaps I’ll substitute one cup AP in the full recipe, but otherwise it tasted fantastic and the texture was exactly as I’d have hoped. Will do a proper test next week, layers + buttercream, and see how that goes. I’m glad you enjoyed the cake, Dio! One tip that helps me when putting together a layer cake is to freeze the cake layers individually in plastic wrap overnight so that they’re solid when stacking and frosting the cake. It keeps the cake from breaking apart and it just thaws underneath the buttercream. It still tastes as fresh as if it was just made, as long as you wrap the layers well, and you don’t have the heartache of tearing the cake to pieces while spreading on the frosting. I hope the next test is a success! Thanks for the update! I ended up increasing the volume of the recipe by 33% to account for 9 inch cake pans, and used 3 cups of cake flour to one cup of AP, it all came together perfectly and was very well received, thank you so much for the recipe and your advice! I’m so happy to hear that the cake was a success, Dio! Thanks for sharing the changes you made as well. Will definitely have to try substituting with part cake flour next time per your advice. It must have such a lovely texture! Trying with that change was a really great idea! Hi! I am wondering if I can use non-dairy whipping cream to go with this cake? Will the cake be too heavy for the cream? Thank you! Hi Cherie, I think it would be a good flavor pairing, but I’m not sure if it would work to frost the cake with. I love the combo of cake, berries, and whipped cream though! Let me know how it goes if you give it a try! I just made this cake and it was SO delicious, wow. I only had 9″ pans, so I just made two and it still worked fine, thanks to your reply on someone else’s comment about the baking time! I did want to see if you had any tips for spreading the buttercream in between the layers? My strawberries were going everywhere and the buttercream was just sliding off of them instead of staying put, making it tough to spread. Not sure if I made the buttercream too thick, or just missed a simple trick? I just used 2c powdered sugar but my buttercream was very firm! I made this as cupcakes for a bunch of non-vegans. Because I am vegan and wanted to have one . Everyine went nuts over them and couldnt believe they did not contain butter or eggs. Thanks so much for sharing! Aw thank you for sharing such great feedback, Malaika! I’m so glad you all enjoyed the recipe! Have a lovely evening. Can you send me instructions for a 3 tier wedding cake? I will have a 10 inch, 8 inch, and a 6 inch tier. Hi Robin, I’ve never made this into a wedding cake so I’m not positive of the precise instructions for you to do so, without making it myself. I’m assuming you can triple the recipe to make enough cakes for all of the tiers you need, I would just advise caution as these cakes are very moist and delicate (being that they’re made without eggs.) so they’re not very firm cakes and stacking them may prove to be difficult without the use of wooden dowels, boards, etc. to keep them from taking on too much weight and possibly sinking or collapsing. I’d definitely recommend trying it first and making a small trial cake before the big day to see how it goes. Good luck! this cake was so good and my whole family loved i shared it with people i do camp with to thank you so much the smiles are going around.! this cake was so good and my whole family loved i shared it with people i do camp with to thank you.! I came across your cake and absolutely love the concept. I wanted to make this for my sisters birthday this weekend but I had two questions. First one being for the avocado oil in the cake? Can I use regular oil? I also wanted to ask about the coconut syrup in the cream cheese glaze? What exactly is that? Is there any subsitution to use for that? I’m excited to try this cake for my son’s first birthday. I’m going to do a practice run this weekend. I only have 9” cake pans though and I’m wondering what adjustments I would need to make to the time? Hi Zeyneb! It will depend if you make 2 or 3 cakes with the 9″ pans. If you make 3, the cakes will be thinner and need less time in the oven, maybe 12–18 minutes? For two cakes they will be much thicker and will take longer to bake, maybe 25–35 minutes? I can’t give an exact time, because that will vary depending on your oven, pans used, etc. The best thing would be to check on them often and remove from the oven once the center of the cake is set and feels springy when gently pressed. I hope you all enjoy this cake as much as we do! Happy first birthday to your son too! WOW this cake is simply gorgeous! Looks amazing! This cake looks amazing! I was wondering for the frosting if I would be able to substitute all of the butter for coconut oil? Or shortening? Hi Akhila! You can substitute the butter with extra shortening. I wouldn’t necessarily recommend coconut oil, only because it melts easily and could make the frosting runny. Let me know how it goes if you give it a try! Have you tried mixing it 3p flour 2p milk? Do you think it would be over mixed? Hi Natalie, sorry are you asking if you can mix 3 parts flour with 2 parts milk? I’m so happy to have discovered your blog!!! Thank you for sharing ❤️ I am looking for a good vegan recipe to use for a wedding cake. Would you suggest this recipe for a classic wedding cake base? Thank you so much! Aww, thank you for the kind words, Jahnavi! This cake makes a delicious vanilla base, but it is a very moist and soft cake, so I think it would depend on how many layers you plan to use. It’s not very firm cake, like pound cake, so I don’t think it would support several tiers or heavy fondant, unless you use lots of support rods and cake boards. I’d make a small practice cake before the big day, just to be sure. Being such an important occasion I’d hate for anything to go wrong! Let me know if you have any other questions I could help with! Wonderful. Thank you for your quick response! Hi! I am loving the look of this cake and wanted to make it for my daughters first bday. Do you have any frosting alternatives? Or will this cake be decent on the less Sweet side for a baby. Hi Krizia! Yes, I have a few naturally sweetened frosting recipes here on the blog. Here’s one made with cashews (link: http://www.wifemamafoodie.com/rainbow-carrot-cake-muffins/) and another made with coconut cream (link: http://www.wifemamafoodie.com/naturally-sweetened-hummingbird-cupcakes/). If you consume eggs, here’s a naturally sweetened Swiss meringue buttercream that’s only mildly sweet (link: http://www.wifemamafoodie.com/naturally-sweetened-swiss-meringue-buttercream/) Also, if you want to keep the strawberry flavor, just add the strawberry powder from this recipe to any of the listed recipes (use more or less, to taste) Let me know if you have any other questions! Enjoy!! Hi. I am trying to find a gf vegan nut free cake (this one looks great) but i need a sugar free cake too as my daughter can only have rice malt syrup or maple syrup as sweeteners. I’m guessing either of these would throw this recipe out significantly…any suggestions? I would really appreciate any advice. Thank you. Hi Emily! I have a chocolate cake that meets those requirements. Recipe here: http://www.wifemamafoodie.com/vegan-chocolate-cake-with-whipped-ganache/. I also have this apple cake (http://www.wifemamafoodie.com/simple-apple-cake/) which has a liquid sweetener, but I found my gf flour blend to be too gummy, so I add a little almond flour to fluff it up some. If you have a good gf flour blend for cakes (Bob’s Red Mill 1-to-1 was the one I tried alone and it was too gummy) then you can use that flour + extra in place of the almond flour, since your daughter is nut free. I’m not sure if you’ve tried it, but there is granulated maple sugar which is maple syrup in granulated form that you might could try in this recipe or others that call for regular sugar. Whichever recipe you choose, please let me know how it goes or if you have any further questions! Thank you so much! I will try this cake and let you know how i go. I can get the flour you mention so will try it with that. My daughtee can’t have apple so the second recipe won’t work for her unfortuntately. I will look into the maple sugar. Thanks again. You’re so welcome! By the way, just to clarify Bob’s Red Mill isn’t the greatest flour to use alone for cakes…it’s a little too gummy. You may already have one you prefer, but the King Arthur GF blend isn’t bad either. Either way, I hope you all enjoy it! Let me know how it turns out for you! Oh thanks for that advice I was going to buy the red hill one. I’m in Australia so don’t think i can get that king arthur one. Can you advise what ingredients i should be looking for in a flour blend? The one I’ve been using is not working. Thank you again for your help. I’m hoping to have perfected a recipe before xmas for my daughter. Hi Emily, so sorry, somehow I missed your last comment! Most of the flour blends I use have a combo of rice flours, tapioca and/or potato starch and some kind of binder, like xanthan gum. Some brands are really gummy though, so I suggest looking at reviews before purchasing a particular brand. Let me know how it goes!! Thank you! No problem you do a great job of responding to everyone. I have only found gummie ones so far but will keep trying. Thanks. Hi your cake looks amazing in the gluten free vanilla cake could I use almond instead of coconut flour?? Hi! I’m looking forward to making this cake for my birthday 🙂 I’m just wondering if you know whether I can substitute the shortening with more butter, because shortening is very very hard to find in the Netherlands. And if so, should I just use the same ammount of butter as the shortening? Thank you! Your lovely strawberry frosting saved the cake and saved the day on for my daughter’s birthday party. All of her little guests (and their parents!) loved it. The crushed freeze dried strawberries is ingenious and delicious!! Before this, I had added strawberry preserves to the frosting which caused the cakes to slide, and I had had to toss it – so sad. So, thank you for the wonderful recipe. Aw thank you Sarah! It’s so encouraging to hear that the recipe helped you on your special occasion. I really appreciate you taking the time to leave such a positive review! Have a wonderful week! I do have one question, I planning on making cupcakes with this recipe. how long should they be in the oven? First time baking a whole cake; and it’s for my daughter’s 4th birthday party. What a gamble right? The cake was a huge hit!!! Thank you!! I made this cake for my son’s sweet sixteen birthday this past week. It is so delicious (everyone loved it, vegans and non-vegans), but I’m wondering if you could clarify your directions. Above the ingredients it says makes 1 8″ cake. Then in the directions it says to prepare 3 8″ pans (as you did in the picture). I wanted to make 2 8″ cakes, so I doubled the recipe. I thought it seemed like a lot, but like to follow recipes exactly the first time I make them. The cakes did end of cooking after 45 minutes and there were a few areas of density. I bake enough to realize there was too much batter in the pans. Hi Gillian! Thank you so much for your feedback. Glad you all enjoyed the cake! As far as how much cake this recipe makes, it’s one three layer 8″ cake, which I’ll clarify in the directions. So if you need two full cakes for a birthday party, you’d double the recipe, which would produce six 8″ layers, and after assembling makes two, 3-layer cakes. Does that make sense? Sorry about the confusion! Please let me know if I can clarify anything else! Have a great day! This cake is for how many persons you think? I have 18 adults coming with 8 young chlidren. I was maybe thinking of doing it in 9in pans and doing 1 1/2 receipe? What do you think? Hi Marie! I think this cake serves about 12–14 people. 1 1/2 the recipe would serve approximately 20–24 people. You can cut them smaller for the children, so I think that amount of cake would be plenty! It’ll probably make 4–5 layers, which might be too many for one cake, but you could maybe make two, or make cupcakes out of the rest of the batter after you fill up 3 cake pans. You could also divide all of that batter into two greased 9×13 pans and make two sheet cakes. Please let me know how it turns out for you, whatever you decide to do! Hi Joycellin !!! Please help me !! I been reading the comments and they’re great comments (so good!!!!) but I tried to make the cake twice and is not cooked It doesn’t rise and I though maybe is normal but inside is raw. Please help me !! I need to do this cake for my nephew, he is allergic to dairy and wheat. Is for this Thursday and I’m getting crazy What could it be that I did wrong ? Hi Joscelyn !!!!! Thank you so much for answering !!! …. ok !! I used everything on the recipe as you asked. Instead almond milk I used coconut milk. First I thought that maybe was to much liquid but after reading all the feedback I was like …what is it ?? Second time, ok it was my fault because I used less milk and oil. I didn’t used vinegar but I did used lemon. First time I cooked it for 30′- 40’and second time I cooked it 30 minutes. The cake in your pictures look a beautiful yellow. Mine is brownish and raw. The mix taste good and when is cooked tasted super good, but it doesn’t cooked through. Oven was 350F. …. I was thinking on using butter instead of oil but as you said don’t use other ingredients, or after reading all the feedbacks, I don’t know what to do. I want to try again, what do you think ?? What could it be ?? I appreciate so much your help !!! Hmm, and you used Bob’s Red Mill 1-to-1 baking flour (in the blue bag) and coconut flour? What size pan did you use? I’m just wondering what could keep it from cooking through? So weird as I’ve never had that problem! Hello !! I used ArrowHead Mills Coconut Flour, and the 1-1 baking Bob’s Red Mill. I used a 6 inch pan. I’m trying to do 3 – 6″ cakes. What do you think could it be ? Hi Joscelyn !!!!!! So sorry I didn’t comment, messaged you before. Love love love your video! That was thoughtful, I so apreciatted !! And try to make the cake again after I saw your video…. but it didn’t work for me. Before I used the stand mixer, after the video I wisked The mix and it looks just like you did. But I think is the oven, mine is electric and yours don’t, right ? I didn’t gave up !! I will try again. You been so kind sending that video ! I don’t know where it is thank you Joscelyn !!!!!!!! Hi Virginia! I’m so glad you found it helpful! Sorry you’re still having trouble with the recipe turning out. It may possibly be your oven, like you mentioned. Does it have a thermometer inside to see the actual temperature it heats up to? I know every oven is different and they don’t always heat correctly. I hope you try it again someday and are able to taste it when it cooks correctly. It’s such a delicious cake! Also, depending on your oven, it’s possible that the cakes just needed to be baked a little longer than the time listed. I give a general time, but it can vary depending on your oven or the size pans you use. Just another thought! I cannot wait to try this out! Finally a way to feed my vegan and gluten free friends with one dessert! I just wanted to ask, with the cups of flour, are they heaped/packed? In the UK we work in grams, and I’ve had a look at conversions for the coconut and all purpose flour, but seem to be finding different results! Hi Anjlee! The cups are not packed. I actually scoop flour into the measuring cup and then level it off with a knife so that the flour does not compact, which can lead to a drier cake. I just bought a scale and hope to begin adding the weighed measurements as well! I’ll try to update some of these previous recipes also 🙂 I hope your conversions are successful and that you all enjoy this cake! It’s one of our faves!! I’m making this for my food allergic son. Do you recommend sweetened or unsweetened non dairy milk? I’ll be using Ripple. Hi Pareeta! I use unsweetened almond milk, but I’m sure it’d be fine either way, just a little sweeter with the sweetened version 🙂 Since this cake isn’t overly sweet to begin with, it should be fine though. Hope you all enjoy it! 1. Did you make any changes to the recipe? Sometimes making adjustments or substitutions can alter the final product. 2.Was your baking powder & soda fresh? Since their effectiveness diminishes with time, I try to replace items like these every couple of months. 3. Did you use larger pans? I used 8″ round pans which made them thick and fluffy. They’ll be much thinner the larger the pan. 4. Were they over baked? These cakes don’t get very brown since there’s no dairy, so they may not look ready when they actually are. If they’re left in a little too long, it’s possible they could shrink away from the pan. Hopefully we can figure out what might have happened and you’ll be able to try them again with success! Let me know if I can help in any other way!! I had the same result too. I used new soda and powder from the shop and my pans were 8″. I used self raising which has bicarbonate in it but didn’t trust it so added the quantities you suggested. My cake is just done and not pulling away from the sides either? Hi Sarah, I’ve never used self-rising flour for cakes before, but I know if too much baking powder is used, it can cause the cake to rise quickly and then collapse, which would make for a flatter cake. I also read this post on King Arthur flour talking about the difference between all-purpose and self-rising flour. They say that SR flour has less protein than AP which can sometimes cause baked goods to be flatter or spread more than usual. Here’s the link to the article if you’d like to read: https://goo.gl/P1Zyy4. One of those reasons could be why it didn’t turn out perfectly. Hopefully it still tastes good! I make this cake a lot for company and it turns out delicious every time. I hope you’re able to try it using regular flour. I think it will turn out better with the right ingredients. This is the vanilla cake of my dreams! I have always had trouble with yellow cake. I have tried so many different formulas and now I need to look no further. This cake has the perfect crumb, has the perfect texture, and the flavor stands up to any accoutrements. Thank you so much for your feedback, Diana! This cake is definitely one of my faves…I’ve already requested it for my birthday in a few weeks 😉 I’m so glad you all enjoyed it and I hope you’re able to find other recipes on here that you enjoy just as much! Have a lovely weekend! Been too long since I visited your blog. Your cakes are as amazing as ever! Aw, thank you, Kimberly! I know, time sure flies! Thank you so much for popping by! Hope you’re doing well, sweet friend! just made this cake and i am stunned at how delicious and fluffy it is. That’s so great to hear! I’m glad you enjoyed it Amal! This is SO pretty. I mean, honestly, this beautiful creation should be on the cover of a magazine. Aaaaand it looks just as delicious. Neeeed to try! Thank you so much for the kindness Karly! It really means a lot to me. I hope you have a wonderful weekend! Such a gorgeous cake! Love how simple, yet stunning, it is! Oh my goodness, thanks for pointing that out! I must’ve somehow deleted it when making an edit. Great guess though, 3 teaspoons (or 1 tablespoon) is correct! I hope it turned out for you!! Oh wow I can’t believe this is actually vegan!! Right up my alley! 😉 The photos look so beautiful too! This cake looks so delicious and beautiful! I’ve never been able to get a cake to be perfectly shaped before. That cake looks delicious! I love that the recipe is vegan. I’m obsessed with strawberries. Definitely going to try this! No this seriously looks tooo good to be true! There is no way you made this by yourself! Well of course you did and I’m proud of you. I love it! I’m in love, especially with those interior shots, sharing! That looks delicious! I LOVE buttercream! Thank you friend! Have a wonderful day! This looks amazing. I love strawberry anything! I bet most people wouldnt even know its Vegan! I know my family didn’t. It actually turned out better than the traditional recipes I’ve used before. This is such a pretty cake Joscelyn. Looking at it just makes me think of spring which I desperately need with these chilly temps that have left me with a dreaded cold. Oh. . .and I love those little dots of berries in the frosting. So feminine & playful. This sounds so good! I need to try this!!!!! Wow, it looks too pretty to eat! I really want to try it though, wish me luck!